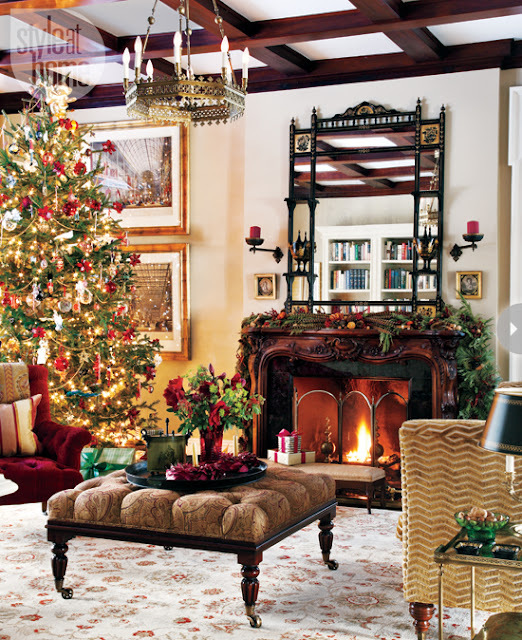 Christmas in July on Tuesdays has an English flair so here are a couple of photos of a room decorated for the holidays and featured in this article Interiors: Regal English Christmas Home. 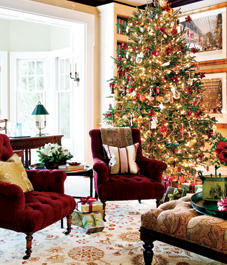 I couldn't find any wrapping photos but the presents under this tree are wrapped in paper as muted and understated as the room decor - you can just see one in front of the tree and a couple more between the two chairs. I always remember English wrapping paper to be less glitzy than what we find here in the States although it's been a while since I've been there at Christmas. It will be on my list of things to do on my next trip to England during the holiday season, check out the wrapping paper!